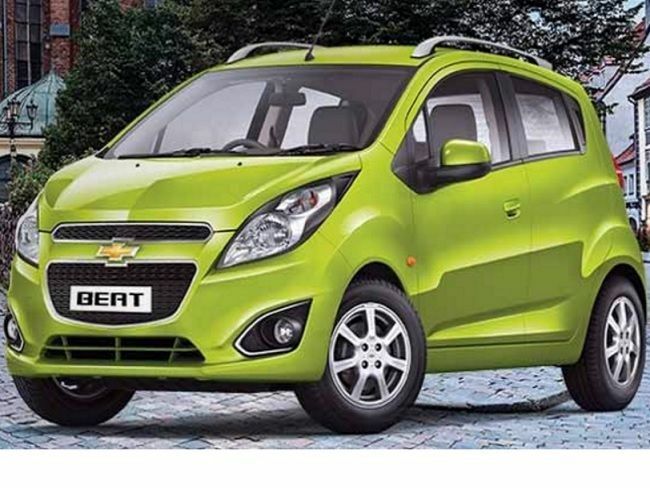 Chevrolet has launched its new 2016 Beat. This car is certainly going to raise the bar of your style quotient. The new beat looks stunning with stylish dual port chrome grille with bold front fascia, jewel effects tail lamps. The IntelliDrive Technology will make sure you get noticed wherever you take the Beat 2016. The exteriors of the Beat 2016 are really impressive and the interiors stylish. The car is zippy and comes loaded with features that are surely going to impress anyone. The new Beat 2016 is crafted with superb engineering which gives it an x factor. It surely will add a charm to your personality. Vibrant Colors: To complement its stylish and funky exteriors the Beat comes in seven vibrant colors to make a bold statement. Your Style Statement: The signature Chevrolet dual port chrome-lined grille gives the Beat a bold and elegant front. And in addition to this you get the extremely impressive headlamps and snazzy fog lamps with a classy chrome-lined contrasting black surround for the perfect, suave city look. Dual tone wrap around bumpers & jewel-effect tail lamps: The dual tone wrap around the rear gives the Beat 2016 a look that stand out and makes heads turn. In addition to this the jewel-effect tail lamps improve visibility and add to the safety. The look of these is gorgeous. The interiors of the Beat 2016 are stunningly spacious and look trendy. The blue illumination on the central console augments its aesthetic beauty. Silver linings in the Interior: The 2016 Chevrolet Beat comes loaded with stunning silver interiors with well equipped and smart features which lets you enjoy a comfortable and luxurious drive. Audio controls on Steering Wheel: The steering mounted audio controls on the steering wheel of the Beat 2016 lets you enjoy music and take its control with your eyes on the road. You would be surprised to see that the knobs and switches are positioned exactly where you want. Seating Comfort: The Beat 2016 seats 5 adults comfortably with ample leg and head room. This makes the car a perfect choice for outings with friends and family. Boot Space: The boot space is big enough to let you carry a lot of luggage to your holidays. 60:40 Split Seats: With the Chevrolet Beat 2016 you don’t have to compromise on boot space as it comes with a 60:40 split folding rear seat which make your drive comfortable and at the same time gives you more room for extra luggage. Cup Holders: Love a dose of hot coffee or a glass of fresh juice? The Chevrolet Beat is loaded with cup holders to hold your favorite can, bottle or cup. The 2016 Chevrolet Beat comes in diesel and petrol variants. It’s a fun car to drive no matter which variant choose. 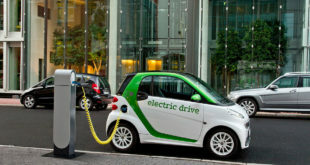 It is zippy, quick and very gives you an easy and relaxed drive. The powerful and dynamic engine makes the Beat one of the best hatchbacks in India. 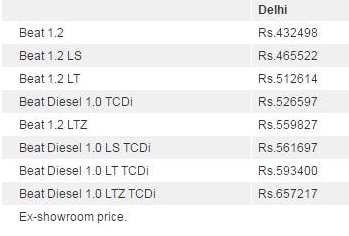 The efficient and economical Diesel Beat: The Beat Diesel is one of the most economical cars in India. 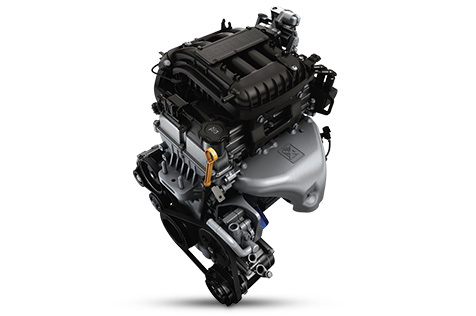 It boasts of a powerful and dynamic 1.0 XSDE SMARTECH engine which gives it 57.1 PS of power and 142.5 Nm of torque. And there’s more to it! The amazing engine promises a mileage of 25.44 kmpl (Mileage as certified by Certification Agencies as per rule 115 of CMVR), making it one of the most economical diesel hatchbacks in India. The impressive mileage will surely make you find new places in your city or go in search for new destinations. 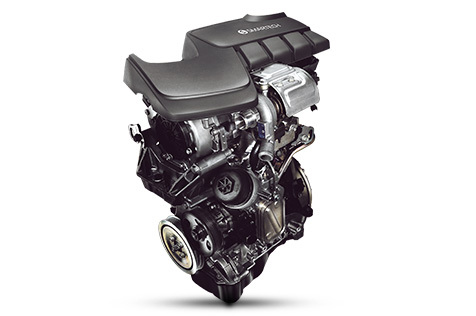 The powerful Petrol Beat: The Beat Petrol has a cutting edge S-TECH II engine which makes driving even greater fun with its powerful engine which gives 106.5 Nm of torque. And to add to it, the Beat Petrol delivers a superb mileage of 17.8 kmpl (Mileage as certified by Certification Agencies as per rule 115 of CMVR). IntelliDrive: Thanks to the 2016 Chevrolet Beat’s elegant styling, cozy interiors and fuel efficiency its already a winner in its segment. But the fact that it comes loaded with technology that not only improves performance, but also the driving experience makes the Beat even more better. The Chevrolet Beat Diesel comes with a modern features called together as ‘InteliDrive Technology’, which make the Beat truly unbeatable! 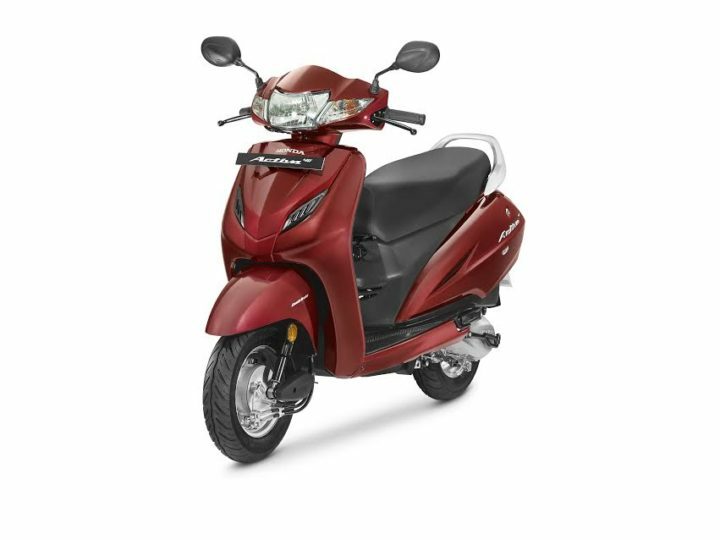 Low Maintenance Cost: Apart from the fantastic mileage the Beat is equipped with tested parts and low cost accessories. Thanks to the trustworthy Chevrolet Complete Care, the Beat will never make you worry about maintenance costs. Low Running Cost: The Beat is equipped with a highly efficient powertrain that enables seamless transmission and a cutting edge SMARTECH engine. This, if not never, will rarely make you think of the running cost. The 2016 Chevrolet Beat is a fun to drive little city car which always ensures your safety. Equipped with twin airbags and advanced safety features, the car will keep you and your loved ones protected. The ELR seatbelts work smoothly when being pulled from the reel to buckle you up. However in case of a sudden jerk or braking it locks the mechanism into position which restrains you within the protective cocoon of your seat. 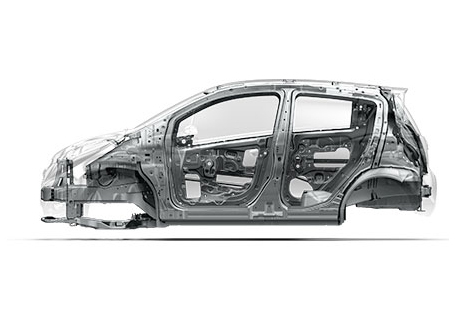 Safety Cage –Almost 60% of the 2016 Chevrolet Beat’s structure is made with high strength steel which gives strength to critical points in the car and keeps all the passengers well protected at all times. Anti-Lock Braking System (ABS) – The ABS prevents the wheels of the Beat from locking while braking and allows perfect steering control, especially on wet and slippery surfaces and keeps you in complete control of the vehicle even in adverse weather conditions. 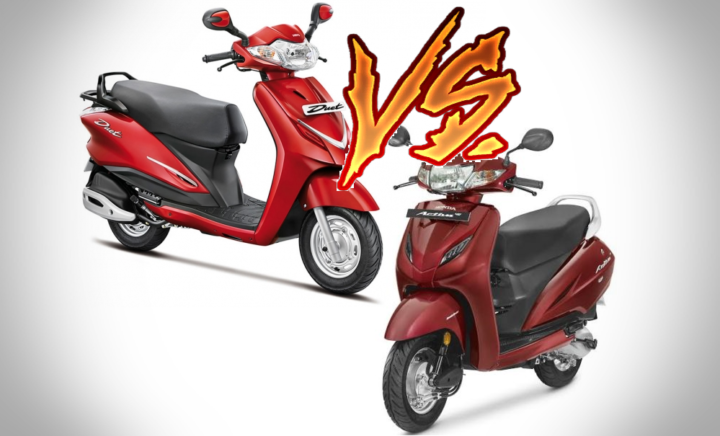 Tata Tigor vs Tiago- Detailed Comparison of price, specs, mileage, dimensions, design etc.